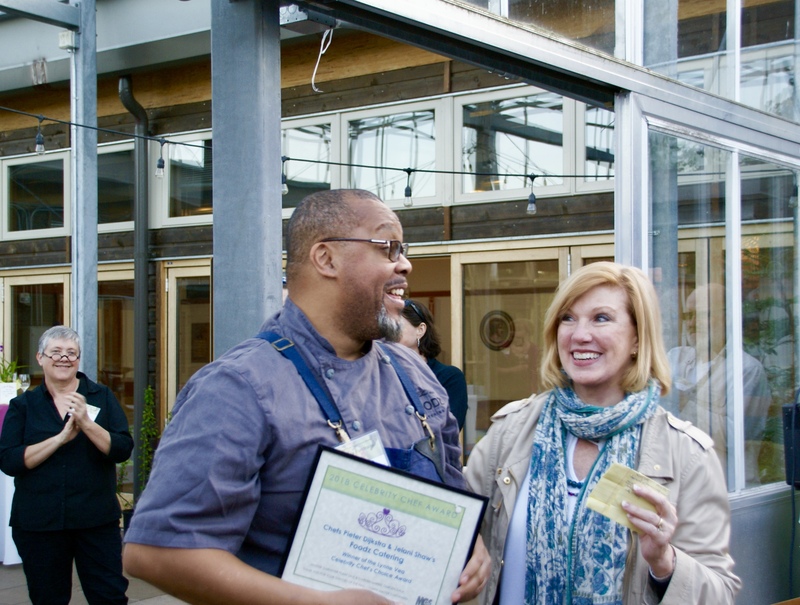 Chefs Pieter Dijkstra and Jelani Shaw received two awards at the Garden Gala May 4th, 2018—the Lynne Vea Celebrity Chef’s Choice Award and the 2018 Ciscoe Morris Golden Brussels Sprouts Award. How did they win, you ask?! 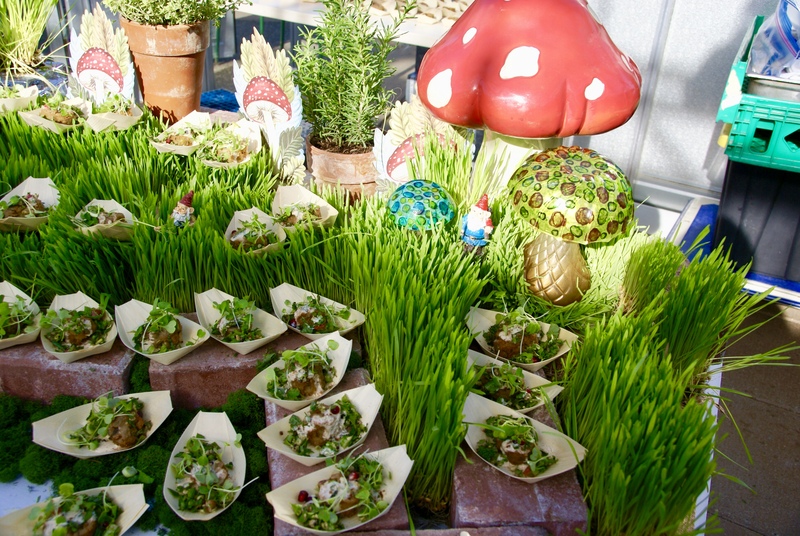 They prepared a Green Garbanzo Bean Cake with Herb Tabbouleh, Preserved Lemon, Pomegranate Pods and Micro Arugula. 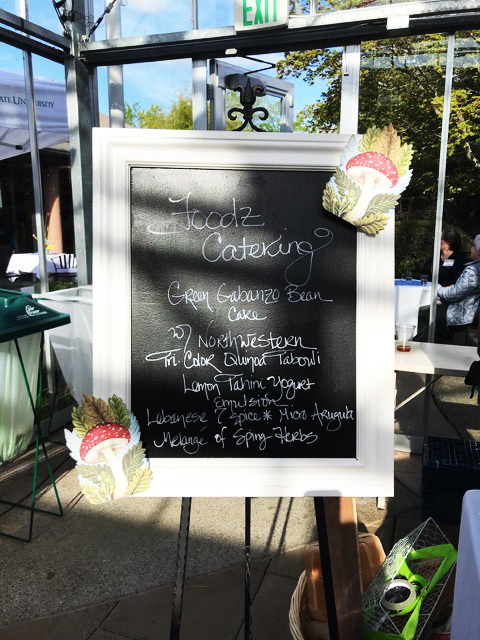 Jelani Shaw and the sales team at Foodz tell us a little bit more behind the event, the decor, and the menu. What is the Garden Gala? Shelby Sewell: The Garden Gala is an annual event held at the University of Washington Horticulture Center in conjunction with a large plant sale. 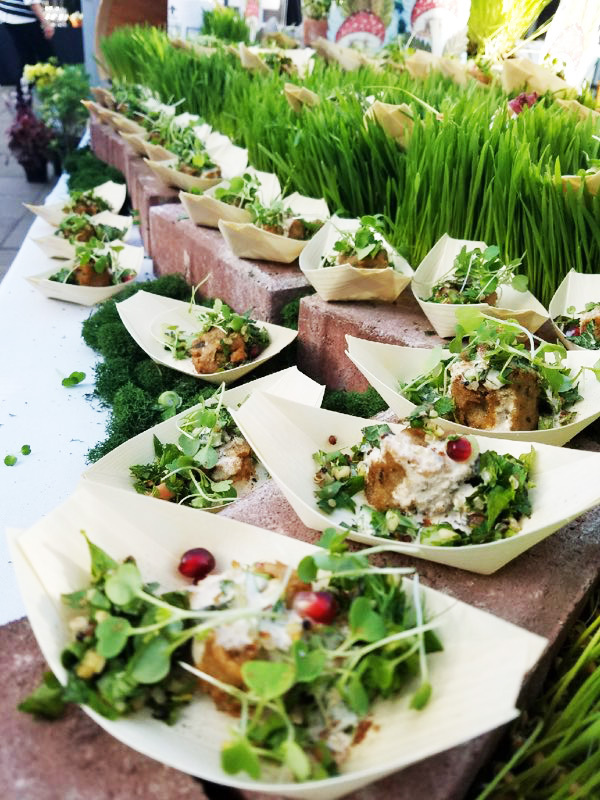 They bring together chefs from various catering companies to compete in the “Herb Challenge.” Each chef creates and presents dishes that highlight herbs and plants being sold. The contest has two parts: popular vote and Celebrity Chef Choice Award. Proceeds from the sale benefit the King County Master Gardeners Association. What inspired you to participate this year? Jelani Shaw: The opportunity arose and I thought it would be a good chance to show off creativity. I wanted to express my culinary voice and show the food I lean towards. Since America is often referred to as the “melting pot,” I borrowed influences from other cultures and I wanted to create a global dish, but make it my own. How did you come up with the menu items? Jelani Shaw: Well, being a herb challenge, I started brainstorming different herbs! I knew I wanted to stay away from French and Asian foods, so I decided to go towards a North African, Lebanese inspired dish. I also wanted to keep it Gluten Free because, Hey…we are in Seattle. What about that menu item was inspiring to you? Similar to our vegan frittata we serve here at Foodz, I used a chickpea flour, but took it up a notch. I’m trying to do what’s next, not Asian or South African flavors. Therefore, I highlighted and elevated the mainstream North African flavors. I used *Lebanese 7-spice in the salad and Ras El Hanout in the chickpea cake. Did you overcome any challenges? Jelani Shaw: The flavor profiles and the basic idea. I wanted a pomegranate glaze, but also yogurt lemon dressing. Therefore, Chef Pieter and I decided on a pomegranate seasoning for this finesse dish instead of a glaze to pair with the yogurt lemon dressing. Jelani Shaw: “That I won!” I didn’t realized it was a contest until the day before. I thought it was only a participation event to support a cause, but I had a good time, it was a lot of fun. Ultimately, I wanted to get people excited about Foodz and what we have to offer. Tell us about the tablescape. How did that contribute to the overall experience for the guests? Davi Sobotta: Being the creative caterer that we are, part of our creativity is in our tablescapes and decor. The occasion being a garden theme, we wanted to create a whimsical, fun, very inviting experience for the guests. Our chef was ordering wheat grass, which was the inspiration for a garden path. We also chose a large chalkboard for the menu ingredients, which we had repainted to freshen it up. Oh, and we can’t forget the garden gnome! Find out more about the Master Gardener Foundation here.